Sweet Memories | Less. More. Abundantly. There’s always been a connection between food and love. In my life that connection has resulted in food being my drug of choice to numb the places where love was not so sweet. However, in this less/more/abundantly journey I’ve been thinking about food as a way of expressing. Take this cake. 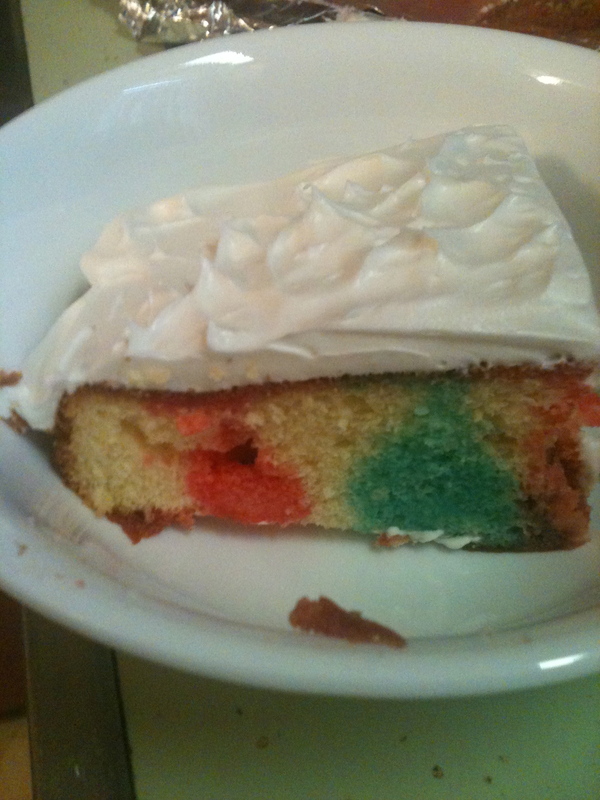 It’s a GOLDEN cake with RED, WHITE and BLUE colors. Yellow cake with strawberry and blueberry jello topped with Dream Whip icing. It’s something I made to celebrate the Olympics. We are Olympic nerds and watch every moment we can. In fact, we taped the men’s tennis finals so we could cheer our fellow Scotsman Andy Murray’s victory after church. The cake was more than just a way to cool the Olympic fever in my house. It was a touchpoint for my remembering and celebrating my Mother. Growing up we almost always had dessert. There was always a treat of some kind to wind down the day. I remember some dubious concoction called ‘fruit float’ which resembled the offspring of yogurt and jello with some very smushy berries. Then there were the homemade birthday cakes. Always 9 x 13 and always vanilla. They were served in their silver pans with a flourish. I miss my Mom. The waves of grief crash far less frequently since it’s been over two years since her sudden passing. However, every now and then the tide sweeps in and I am again overwhelmed with missing her. I make myself remember her high pitched laugh, a rare occurrence for only the silliest of moments. Her quick wit and her no-nonsense, take no prisoners attitude. And I make myself remember her hands, always busy, always with perfect nails. I remember her hands patting my back for our last embrace just weeks before she was embraced in Heaven. To connect with her, I sometimes take down her ancient box of recipes. Written in her perfect script (she had the most beautiful handwriting of any person I have ever known) were the tastes and memories of my childhood. I read each one and, as the waves take me out on a sea of melancholy, I kiss a card or two. I couldn’t find the ‘Jello Cake’ recipe in the box. So I made it up from memory. She probably did too, all those years ago. Hers was better. I’ll have another piece of that jello cake. It violates the ‘eat less’ part of this journey. However, the sweetness of sharing one of MeeMaw’s recipes with my family will make it a little easier to swallow the grief. It will also allow me to do something I failed to do enough of when she was here-love my Mother abundantly. All this in a yellow cake, baked in a silver pan and sweetened with memories. I love those memory triggers! So fun. Thanks for sharing your thoughts! !